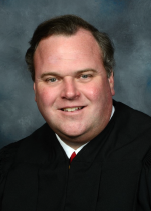 Mississippi Supreme Court Justice David M. Ishee will be the guest speaker on May 18 at the 15th Circuit Drug Court’s graduation ceremony in Picayune. The 10 a.m. graduation program will be held at Resurrection Life Church, 795 Memorial Boulevard in Picayune. Circuit Judge Prentiss G. Harrell will preside over the ceremony. Thirty-five people are expected to graduate. Several of the graduates are expected to tell their personal success stories. Judge Harrell and the 15th Judicial District Drug Court cordially invite the public to the graduation celebration. “Let these participants know that you are proud of their success and that you will continue to support them as they make the transition from the Drug Court setting to personal accountability,” Judge Harrell said. May is National Drug Court Month. Many drug courts across the country schedule graduation ceremonies to coincide with the national observance as well as with high school and college graduations. The 15th Circuit Drug Court currently has more than 270 participants enrolled. They are from Jefferson Davis, Lamar, Lawrence, Marion and Pearl River counties. During the past year, Drug Court participants paid more than $79,000 in fines, court costs and restitution to their respective counties, and more than $86,000 in court program fees that help support the operation of the Drug Court. People enrolled in the drug court pay $75 a month to participate. Two significant grants obtained by Pine Belt Mental Healthcare have allowed the Drug Court to expand its services. A Bureau of Justice Assistance grant approved in October 2016 pays salaries of a clinician and a peer support specialist to assist Drug Court participants. The BJA grant totals $898,209 spread over three years. The clinician provides both one-on-one treatment and group treatment at offices in Purvis, Millard and Columbia. The peer support specialist encourages and supports participants as they pursue educational and professional goals: seeking a high school equivalency degree, enrolling in college, or gaining meaningful employment. Five participants enrolled in college since July 2017, and eight took vocational training, according to fiscal year data collected by the Administrative Office of Courts. Forty-two people found employment. In October 2017, funds became available from a grant from the Substance Abuse and Mental Health Services Administration to help pay for drug rehabilitation treatment at Clearview Recovery Center. The SAMHSA grant totals $898,131, spread over three years. Since July 2017, 18 participants have been referred for in-patient drug treatment, 41 were ordered back into treatment and 37 were sent to group or individual counseling.